Competitions also support "pair competitions" and "team competitions" to some extend. Following chapters will explain different settings available when creating competitions. Course: select the course for your competition first. Date: when the competition will be held. In case of a multi day competition, set the starting day here or the date of each round separately. Time: is the actual starting time. Competition name: default name for English users is "Small competition", but you can and should change it into anything you like. This is the name for the competition also shown in search results and different list views. Comment: some additional information about the competition. For example details on payment or prizes. Practice: unofficial practice rounds. These can also use groups and classes, if needed. Competition: regular competitions where everyone is playing by the rules, but doesn't have to be official. Competitions between friends etc can also use this competition type as long as all holes are played according to official rules. Doubles: Doubles competitions. These competitions are not impacting ratings. C - PDGA: C-tier PDGA regulated competition. B - PDGA: B-tier PDGA regulated competition. A - PDGA: A-tier PDGA regulated competition. by URL: only via link, but not included in search results. please note that this link is also available via course result lists. Only myself: no one else except the current user can see the competition. This option is mostly for training rounds. Create competition: at the end, create the competition by clicking this button. Before this, the competition doesn't exist yet and you can also Cancel at this point without creating a competition. Detail: basic settings for a competition, some new after creating like: type, groups, classes and more access rights. Players: player management, copy/add/remove/change players, classes, groups, payments etc and generate groups. Public: settings related to how competition and results are shown to users following the competition. Also player registration related settings are here. Rounds: connections between different competitions and rounds under a same tour. Here you can create new rounds and move between rounds and competitions within the same tour. Club: Select the club that is organizing the event. You can only choose from clubs you are a member of. Country: Select country in which the event is held. Not all courses have full location details, so knowing the country is a minimum. Use groups: whether competition uses groups or not. This has be set to Yes, in order to enter scores per group. Additional info available on Managing groups. Use classes: whether competition has multiple classes or just one (no classes). Collect Metrix-info: This settings allows to collect additional statistics on ICP, OCP, GRH and PEN. Additional information available on Metrix statistics. Require players to sign scores: After the round, require players to sign scores. This will lock the results, so that only event officials can make changes after signing. More information about this feature here. 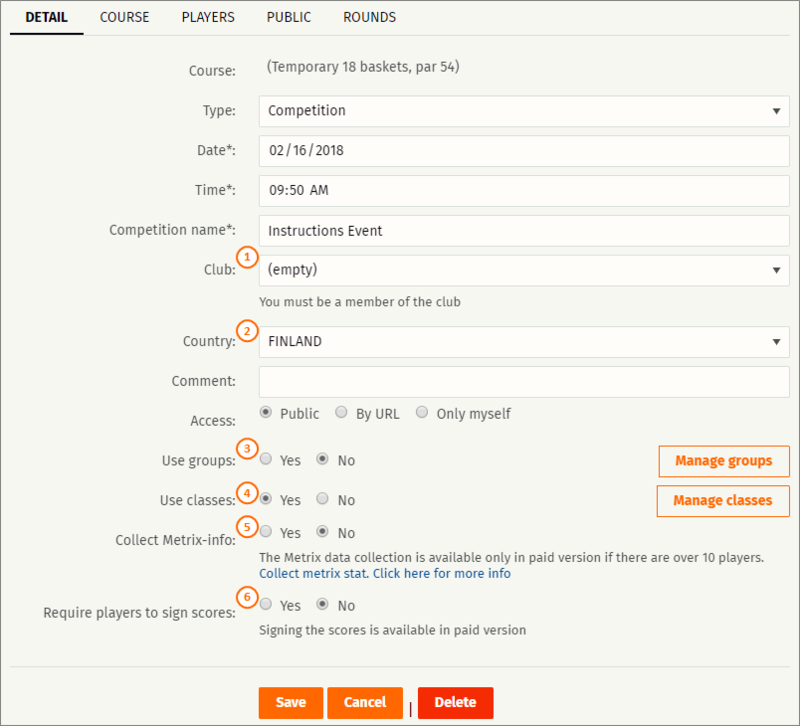 Tournament director can also give permissions to other users and control the entering of scores under the Rights section under Details. 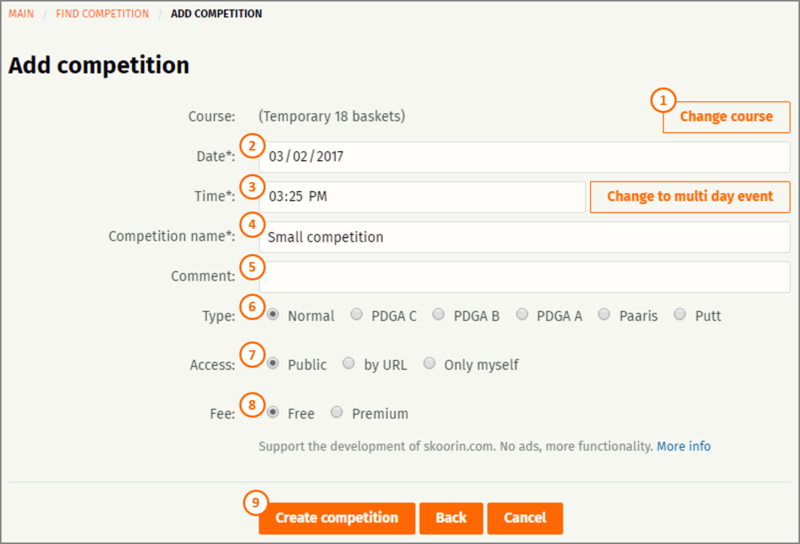 Administrators: User who created the competition is automatically an admin, but you can also add others users to be administrators. All admins can do same things as the user who created the competition. Other users may enter results: Admins can allow other users to enter scores without being administrators. These so called "scoring officials" can be very handy in more official competitions. Or if not all players can enter scores. All users can mark: This settings simply allows any skoorin.com user to enter and update scores in this competition. Can be used for example in Doubles competitions. Closed for entering results: When competition is completed, this setting will close the results from further updates. It's recommended to close competitions after results have been verified. The last line in the Rights section sums up the previous settings by stating what has been setup.